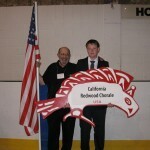 The California Redwood Chorale is currently accepting applicants for auditions. All sections (SATB) are open for auditions. We are looking for good singers with reading skills. TENORS AND BASSES ARE VERY NEEDED! We rehearse in Petaluma on Sundays from 1 – 3. To contact us please call Gerry Schultz 707-874-3770. The California Redwood Chorale was accepted as a participating choir in the prestigious International Choral Kathaumixw in British Columbia, Canada. 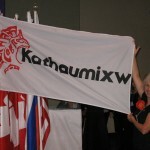 Elliot Simon carried the American flag in the opening ceremony and Gerry Schultz shows the Kathaumixw banner. Over 1000 singers from around the world participated in this wonderful festival. Click on the picture to view it larger. This photo was taken in Foldvar, Hungary in the Lake Balaton region. 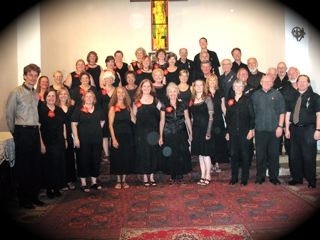 The California Redwood Chorale had just completed a series of five successful concerts.